Shortly after moving to Paris, we found a charming apartment in a historic Haussmannian building in the 14th. It was small and I wasn’t sure what it would be like in the 14th arrondissement. Given how crazy the apartment market in Paris is, we took it although the apartment wasn’t exactly what we thought it would be (“CLEAN ME” written into the blinds). That said, I instantly fell in love with the neighborhood. Most people only visit the 14th for the Montparnasse Tower or the Paris Catacombs, however hopefully this little guide inspires you to find some good food after visiting the catacombs. The 14th arrondissement is home to some of the best markets in Paris, so if you’re into experiencing the local side of Paris, I recommend coming to this neighborhood ready to explore the shops, enjoy its atmospheric cafes, eat crepes, and image yourself sitting among the most famous intellectuals of the 20th century. Similarly, you can visit some of the biggest attractions in Paris: the Catacombs as well as the Montparnasse Tower for views of Paris. Lastly, you’ll be able to discover the secret streets and former villages that truly make the 14th arrondissement truly special. More history and insider tips below! Originally one of the suburbs of Paris, Montparnasse was annexed into Paris in the late 1600s. It was known for being a working-class neighborhood for many years, which is why it partially appealed to artists. In the late 1910s, Montparnasse became the intellectual hub of Paris due to its cheap rents, many cabarets, and creative atmosphere. Most of the most famous intellectuals of the time (including Ernest Hemingway and Picasso) were found spending time in Montparnasse. Following World War II, the intellectual hub ceased to exist. Now, Montparnasse is a middle-class Parisian neighborhood with nice architecture, affordable restaurants, and reasonable(ish) prices for an apartment within Paris. I generally feel pretty safe in the 14th arrondissement as it’s a residential area that is a bit calmer. There were quite a few nights where I walked back quite late by myself and the most unnerving thing was how quiet the street was. My previous home was very close to Rue DaGuerre and I always loved how you’d find lots of couples strolling down the street in the evening. Closer to the Paris Catacombs and on the Metro (in general), I’d be careful of pickpockets as it’s an issue in Paris and they often target tourists at big attractions in Paris. It’s hard to ignore the fact that the Paris Catacombs is down in the 14th arrondissement. Although most tourists pick up their tickets and leave almost immediately after visiting the catacombs, they’re missing out on some fantastic local markets and food. Tickets for the Paris Catacombs can be a bit hard to come by and many people opt to pay extra to skip the often sizable lines. The Paris Catacombs are underground ossuaries built in the 1800s to help with the overcrowding in the Parisian cemeteries. The tunnels were originally mines used for stone used to create the stunning architecture around the city, however these mines were often ill-maintained. Following the collapse of one of the mines, the mines were fortified and the idea of moving the bones came to be. It’s estimated that the bones of six million Parisians lie within the catacombs. In an attempt to clean up the graveyards, Louis-Étienne Héricart de Thury was commissioned to create a thought-provoking display reflecting on the meaning of death. For those that aren’t comfortable with bones, this may not be for you, however it’s a fascinating attraction for those interested in learning about the history of Paris. Since then, it’s been a curiosity for kings and tourists alike. You can head to the top of Montparnasse Tower for some of the the best views of Paris. Although it’s not free, it’s a favorite of my Parisian photographer friends who love the view of the Eiffel Tower from here although it’s not for those on a budget and/or those who are afraid of heights as the viewpoint is on top of one of the tallest buildings in Paris. Following the banning of cemeteries within the center of Paris in the late 1700s, Montparnasse was appointed the cemetery for the south of Paris. You can view the grave of Baudelaire here. It’s free and open until sunset. For a taste of the countryside that used to be this part of Paris, you’ll need to seek out the former remnants of the previous villages around Paris. Most only last a block (or two), but you’ll feel instantly transported as soon as you find one of these secret spots in Paris! The cobblestones lead to to the stunning Rue des Thermopyles although the brief countryside feeling as you pass the little yard with animals feels out of place in modern day Paris. It’s not a guarantee that you’ll be able to enter the private road that is Villa Hallé, however if you’re lucky enough to get inside, you’ll need to soak in this atmosphere. Villa Hallé dates back to the time that the Catacombs were established as the land was considered too weak for multi-story buildings. As a result, most of the houses have remained one story and the countryside feeling has attracted a lot of artists who had their studios in this plot. Look for 36 rue Hallé. Villa d’Alésia is where Matisse had his studio. Luckily, it’s open to the public and despite rising prices in Paris, many artists still have their studios in this stunning little village of Paris. 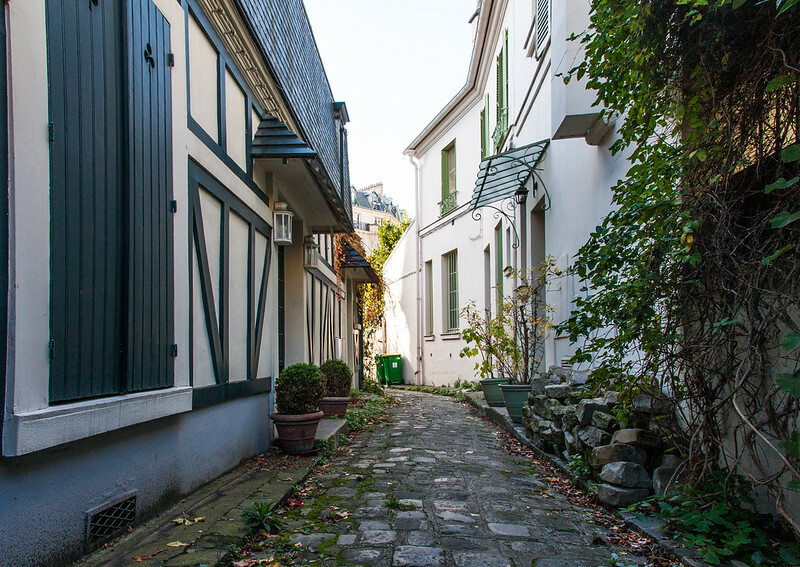 Rue des Thermopyles is widely considered one of the most beautiful streets in Paris and it’s hard not to see how… Until 1959, this street was not open to the public, but luckily now, any lucky pedestrian can enjoy its leafy vines and cobblestones. Named the “passage of Hell,” this stunning street is far from hellish… The name only refers to a name of a former Boulevard that used to run close to this street. Interestingly enough, this street was part of the early housing estates in Paris. Les Grands Voisin is a former abandoned hospital that is being converted into mixed-use housing. Until the housing is built, it is being being rented at an affordable price to various charity organizations, a bar, a restaurant, artists, and even startups. Things may change soon, but be sure to drop by this interesting building before it turns into housing. You can’t miss this cozy weekend flea market. You’ll find a nice mix of antique and oddities here, so be sure to bring some cash as most do not accept cards. You’ll find about two hundred stalls here and countless treasures to be found. Click for more information about the flea market. On Saturdays, head to the Brancusi biological market for organic foods and produced within a stunning building. Whether you’re looking for something sweet–or some quality fruit, stop in here for some good organic shopping in the 14th arrondissement. Rue DaGuerre is considered to be one of the best shopping streets of Paris and I recommend bringing cash with you to ensure that you’re able to buy some of the fantastic local produce that you’ll find here. Unlike some other shopping areas of Paris, it’s mostly locals, so you can stop into various shops to buy individual ingredients for a meal. Even if you don’t have a kitchen, it’s a joy to browse Rue DaGuerre for little things. You’ll also find a number of clothing stores here. I particularly love C’tendances (51 Rue Daguerre) for their vintage-inspired dresses. On Wednesdays and Saturdays, you’ll find this fruit market close to rue d’Alésia in full-swing. Bring cash and stock up on fresh vegetables. This cafe is where Parisian intellectuals would gather in Montparnasse. The owner famously accepted paintings and drawings for payment until the artist could pay. Come here to get inspired by Picasso. This third-wave coffee shop is a really great place to sit to relax with a good cup of coffee. It’s quiet with limited seating, but one of my favorites. The nearby street has some interesting shops as well. Every single time that I’m on Rue DaGuerre, I stop off here for a wrap (under five euros). The wraps are always satisfying and I particularly like the one with chicken. They’re also a proper restaurant with lunch/dinner specials. The area close to Rue du Montparnasse is famous within Paris for its Breton crepes. Here, you’ll find a lot of competition as there’s more than fifteen creperies along this street. It’s hard to go wrong here and if you’re looking for the best place to have a crepe in Paris, you MUST come here. A Parisian friend recommended Crêperie de Pontivy, which is nearby although not on this street. I’ve not had a bad crepe yet! This Iranian restaurant has some authentic food. I went to this Montparnasse restaurant with an Iranian friend of mine who was a bit surprised by the menu (in a good way). I felt that the meal and portion sizes were very reasonable considering the price. This wine store and bar is perfect for a lazy evening sitting outside in good weather. You can buy wine from the glass for an affordable price after discussing the wine varieties with the knowledgeable staff. There’s limited seating, so if you want to come here on a Friday, good luck. This was my local boulangerie. The bread is truly fantastic, but be warned that they run out. If you’re looking for a fresh baguette, be sure to come here in the morning. The pastries are fantastic too. Macarons? Yes, please! I can blame one of my good friends for my macaron habit. Although a lot of people go crazy over Laduree and other famous macaron makers, some of the best macarons that you’ll find are at more anonymous bakeries throughout Paris. Personally, I was quite pleased with these and the price was decent considering the quality! This Chinese restaurant has affordable bao as well as fresh Chinese food at a reasonable price. I stumbled upon this place by mistake, but the bao was some of the freshest that I had in awhile. If you’re looking for a reasonable hotels in Paris, the 14th arrondissement is a great area to stay in as it’s far enough from the main attractions that you don’t pay the center premium, you have access to great food markets, and it’s a quick journey to the main sights. For a luxury 4* experience, consider staying at Hôtel Aiglon. For a quirky mid-range boutique hotel, consider BoB Hotel by Elegancia. For anyone looking for a hotel on a budget, consider the Montparnasse Daguerre or Apollon Montparnasse. There are also a number of apartments in Montparnasse available in the 14th if you’re looking for a more home experience with a larger group. There’s also one hostel in Montparnasse. Check hotel prices in the 14th arrondissement now! Depending on which Paris Metro stop you’re close to, you’ll have access to a large number of metro lines as well as RER lines. I recommend checking carefully prior to booking as some areas if you want to minimize walking to the major attractions. There’s a direct bus that runs from outside the Denfert-Rochereau station to the ORLY airport. Metro lines in this area: 4,6,13, and 12. I’d recommend trying to avoid going through Gare Montparnasse as the station is huge and it takes some time to find your train. I recommend prioritizing staying along the route of the 4 Metro as it runs through 6th, 1st, 10th, and 18th arrondissements. The 6 metro heads towards the Eiffel Tower. Have you spent time in the 14th arrondissement of Paris? Click for my guide to the covered passages of Paris. Click for a complete Paris arrondissement guide.